When working with food, it is essential that the rules of cleanliness be followed and that means lots of hand washing. You can wash your hands with dishwashing detergent or you can use soft soap. I prefer soft soap, since it is intended for hands and not dishes. However, have you ever stopped to think how much you are paying for that little bottle of soap? Much more than a bar of soap costs, but it is handy and so we pay for it. Have you ever thought of making your own? Not that I would go out of my way and buy soap bars just to make soft soap with, but I am one of those people who just cannot throw soap scraps away. You know, those little slivers of soap that are left and are just too hard to deal with? There was one time, when I used to sew them into washcloths and give them to the children in their bath. You didn’t have to worry about them slipping on the soap that they forgot to take out of the water. But the children are grown now and I am still saving soap slivers. Then it dawned on me that I could make my own soft soap and that is what I did. And here is how I did it and how you can do it too. 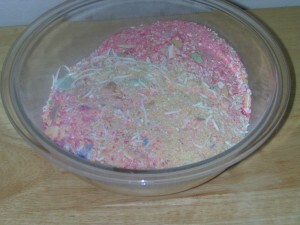 Gathered together all my soap scraps and then shredded them with the medium shredding blade in my food processor. The Pros of doing this is that you don’t have to shred or slice by hand as some sites suggest. The negative items are more numerous than the pros but if you don’t have any of the problems listed, then it is still easier to do it in the food processor. If you have respiratory problems, don’t use the food processor as there will be significant soap fumes arising during the process. It took about 3 washings to get all the soap residue out of the food processor bowl and pusher assembly. I am assuming that most of the people who attempt this project will not have 25+ years of soap scraps as I did and therefore most likely won’t have the problems listed in the negative section of this project. I ended up with 5 cups of shredded soap which is a lot. Purchase distilled water for this project so that you won’t have impurities from the water impeding the process. For my 5 cups of Soap Scraps, I purchased two Gallons of Distilled Water. Using a large pot, I brought one gallon of the water to a boil and then added the soap shreds. Shut off the heat and let stand for about 15 minutes; the soap will melt during this time. 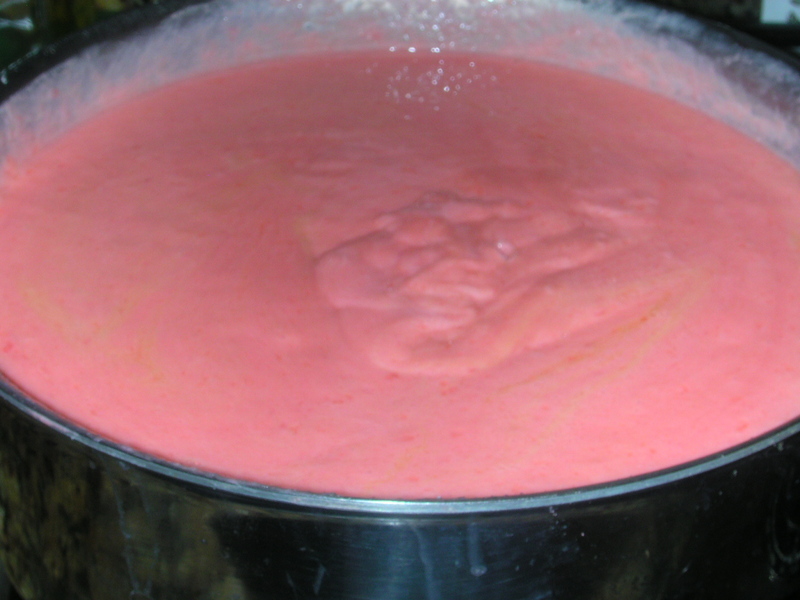 Using a submersion blender, (a hand mixer will work as well) I emulsified the soap with the hot water until the soap was melted. Allow the mixture to stand overnight and then blend again as in #6. Because I had so much shredded soap, I had to add more Distilled Water to the mixture. Once you are satisfied with the concentration of the mixture, then it can be poured into dispensers. 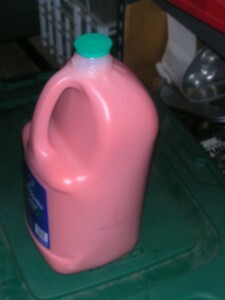 Since I had so much, after I filled my dispensers, I had enough to fill one of the gallon water bottles and then some. To further enhance my soft soap and make it nourishing for my skin, I added 1 cup of Olive Oil to the soap mixture before bottling it. It takes very little to wash your hands and it helps to keep your skin soft. Now I have enough soft soap to probably last me many months or even years. And all it cost was the price of a gallon and a half of Distilled Water which came to $1.50 plus the water it took to rinse out the soap residue from the food processor bowl and of course the heat it took to boil the water, which by the way was insignificant. The homemade soft soap is now enhancing the kitchen, bathroom and service porch hand washing areas.